Since the release of “MAN OF STEEL” back in 2013, the D.C. Comics Extended Universe (DCEU) franchise has been in a conundrum. Although the 2013 film and with the two movies that followed – “BATMAN V. SUPERMAN: DAWN OF JUSTICE”and “SUICIDE SQUAD” – were all box office hits, they had been heavily condemned by many film critics. Then along came “WONDER WOMAN”, the first superhero movie that featured a woman in the lead since 2005. The photographic plate led Diana to recall her past, starting with her childhood on Thymerica Island. While being raised by her mother, the Amazonian Queen Hippolyta, Diana learns about Zeus’ creation of mankind and his son Ares’ jealousy of his father’s creation and the latter’s attempts to destroy humans. After the other Mount Olympus gods were killed by Ares, because of their attempts to stop him, Zeus created a weapon for the Amazonians, a “Godkiller”, in case Ares decides to return. 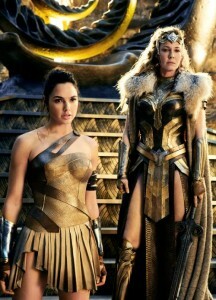 Although Queen Hippolyta has no trouble telling Diana about Zeus, Ares and the other Mount Olympus gods; she forbids her sister and military leader of the Amazons, Antiope, to train Diana. Eventually she relents and demands that Antiope train Diana harder than the other Amazons. During the last year of World War I, Diana rescues an American military pilot named Captain Steve Trevor, after his plane crashes off Themyscira’s coast. The island is soon invaded by German sailors from a cruiser, pursuing Trevor. The Amazons engage and kill all of the German sailors, but Antiope sacrifices herself to save Diana. Interrogated with the Lasso of Hestia, Trevor informs the Amazons about World War I, his position as an Allied spy and his mission to deliver a notebook he had stolen from the Spanish-born chief chemist for the German Army, Dr. Isabel Maru. The latter is attempting to engineer a deadlier form of mustard gas for General Erich Ludendorff at a weapons facility in the Ottoman Empire. Against her mother’s wishes, Diana decides to help Steve’s war efforts by leaving Themyscira and accompanying him to London. Recalling Hippolyta’s tales about Ares, she believes the latter is responsible for the war and hopes to kill him with the help of the Lasso of Hestia and the “Godkiller” sword that Zeus had left behind. Thinking about the No Man’s Land” sequence reminded me of other action scenes in the movie that I found satisfying. 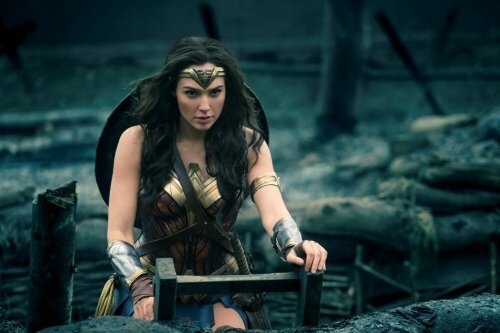 Those scenes include a montage of Diana’s training as a warrior, the Amazons’ defense of Thymerica against invading German sailors, Diana and Steve’s encounter with a group of German spies in a London alley. The “No Man’s Land” sequence eventually led to another fight in which Diana, Steve and their companions led a liberation of the Belgian town Veld, which had been occupied by the Germans. You know what? It is possible that I may have enjoyed this sequence even more than the charge across “No Man’s Land”. One, it lasted longer. And the sequence featured more of a team effort between Diana, Steve, their three companions and troops from the Allied Powers. In fact, one scene featured Steve remembering an Amazonian tactic from the Thymerica battle and utilizing it with Diana in Veld. I literally smiled at that moment.But “WONDER WOMAN” was not all about action scenes. Personally, I regard the movie as a character study of its lead character. Ever since Diana had informed Bruce Wayne that she had walked away from mankind for nearly a century in “BATMAN V. SUPERMAN: DAWN OF JUSTICE”, I have always wondered what led her to become that slightly cynical woman. For me, “WONDER WOMAN” told that story . . . to a certain extent, thanks to Allan Heinberg’s screenplay. The Princess Diana aka Diana Prince that we see in this film is an intelligent woman with a fierce sense of justice and duty. Whereas her mother and other fellow Amazons want to isolate themselves from humanity and the rest of the world at large, Diana views Steve’s arrival and his revelation about the war being raged to save humanity from what she believed was Ares’ destructive influence. Diana is also portrayed as a compassionate woman incapable of turning a blind eye to the devastating effects of war upon the Belgian civilian population and servicemen like Charlie, a Scottish sharpshooter and ally of Steve’s, who suffered from posttraumatic stress disorder (PSTD). 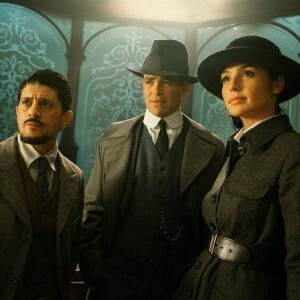 She also possessed enough compassion to become aware of the discrimination that Steve’s other two friends faced – the Blackfoot warrior and smuggler Chief Napi and the French Moroccan secret agent, Sameer.But Diana’s belief in Ares’ role in the Great War also revealed some negative aspects of her personality. One aspect of Diana’s personality in this film was her naivety. There were scenes in which her naivety about the “world of man” that I found humorous – namely her shopping trip with Steve’s assistant, Etta Camp; her introduction to ice cream; and her discussions with Steve about human sexuality. But there were plenty of times when I found her naivety very frustrating – especially in those scenes in which Steve tries to explain the true ambiguous nature of human beings and the war. A good example was Diana’s interruption of the Allied Powers’ high command and her attempt to instruct the generals on how to “run a war”. Many found this scene as an example of Diana’s feminine empowerment. I found it as an example of her naivety and a bit of arrogance on her part. In these scenes, Diana seemed to display a stubborn, almost hard-headed and blind reluctance to let go of her misguided beliefs. Because of this unwillingness to believe she might be wrong about matters, Diana killed one of the characters believing him to be Ares without any real proof. I found this moment rather frightening. This hard-headed trait revealed what I believe was one example of Diana’s penchant for extreme behavior. Diana’s angry and frightening reaction to Steve’s sacrifice was another example. And the hard lessons she had learned about humanity, along with personal tragedy, led to her almost century long foray into emotional isolation. In many ways, Diana’s journey is that if an idealist, whose positive assumptions had been ripped away in the most painful manner. Now, one could say that Diana had acquired this attitude during the 97 years between her showdown with Ares and the incident with Doomsday. But she made it clear to Bruce that she had walked away “a hundred years”, which is roughly between the end of World War I and “BATMAN V. SUPERMAN”, save a three years. Why did Jenkins and Heinberg allow her to spout that line about how love with save the world? Was this some emotional sop to those critics and moviegoers who wanted to pretend that Diana had managed to avoid wallowing in her grief over Steve and disappointment over Ares’ revelation? If so, that is bad writing . . . or bad timing. Jenkins and Heinberg could have saved the line for Diana’s narration at the end of the movie. After she had received the photographic plate and Steve’s watch from Bruce . . . and after she had finally lifted herself from her cynicism and detached air. Connie Nielsen’s portrayal of Diana’s mother, Queen Hippolyta of Thymerica proved to be more interesting that I had assumed it would be. Frankly, I thought Queen Hippolyta would be a somewhat bland parent figure, who was simply protective of her only daughter. In the end, Hippolyta’s protectiveness toward her daughter proved to have a major impact upon the latter. This same protectiveness, along with her world-weary response to Diana’s decision to leave Thymerica revealed the true, ambiguous nature of the character and Nielsen did an excellent job in conveying it. Robin Wright had an easier time in her portrayal of Diana’s aunt, Antiope. The actress not only did a great job, I was especially impressed at how she embraced the more physical aspects of the role. After all, Antiope was the Amazonian army’s lead general. I was very surprised to learn that the actress who portrayed Etta Candy, Steve Trevor’s assistant, was none other than Lucy Davis, who had a supporting role in the 1995 miniseries, “PRIDE AND PREJUDICE”. Personally, I adored her portrayal of Etta. Like Taghmaoui, she was a walking embodiment of charm and wit. I especially enjoyed Davis’ performance in the scene that featured Diana and Etta’s shopping trip. David Thewlis gave a superficially pleasant performance as the dignified Sir Patrick Morgan, a diplomatic liaison with the Imperial War Cabinet. I found him intelligent, subtle and a little tricky. I have a confession to make. I have always liked Gal Gadot as a screen presence. Honestly. She has a very strong presence. But I have never considered her as a top-notch actress . . . until recent years. But I must admit that her portrayal of Princess Diana of Thymerica aka Diana Prince aka Wonder Woman really knocked my socks off. I was impressed at how Gadot managed to portray Diana during two distinctive phases in her life – the naive, yet stubborn young woman who seemed convinced that she knows what is best for the world in this film; and the cynical and weary woman who is somewhat contemptuous of the world in “BATMAN V. SUPERMAN: DAWN OF JUSTICE”. And she did such a marvelous job in conveying this two phases in Diana’s life . . . in two different films. Ms. Gadot has come a long way. I think Steve Trevor might one of my favorite roles portrayed by Chris Pine. Aside from the fact that he has great chemistry with Gadot, Pine gave a very entertaining portrayal of the American intelligence officer who first befriends Diana and later, falls in love with her. I found it fascinating to watch Pine convey Steve’s intelligence, cunning and wry sense of humor. I also found it fascinating to watch how Pine conveyed Steve’s struggles with Diana’s naivety, stubborness and impulsive behavior. And he did so with a great deal of skill. “WONDER WOMAN” is the fourth film released through the D.C. Comics Extended Universe (DCEU). And like the other three, I found myself not only enjoying it very much, but also impressed by it. Aside from a few flaws, I thought director Patty Jenkins did a first-rate job in telling movie audiences the story of how Princess Diana of Thymerica became Wonder Woman . . . and how she also became that world weary woman from 2016’s “BATMAN V. SUPERMAN: DAWN OF JUSTICE”. And she did so with a first-rate movie crew and a wonderful cast led by Gal Gadot. Ever since the release of the DCEU’s new movie, “WONDER WOMAN”, film critics and moviegoers have been raving over it and raving over the Diana Prince aka Wonder Woman character as this ray of sunshine in the middle of Warner Brother Studio’s DCEU’s “doom and gloom”. Sigh! First of all, the main reason I had looked forward to seeing “WONDER WOMAN” in the first place was my curiosity over the main protagonist’s development. I was curious to see how the Wonder Woman/Diana Prince character had transformed into the somewhat cynical and weary woman that I saw in the 2016 film, “BATMAN V. SUPERMAN: DAWN OF JUSTICE”. That was it. 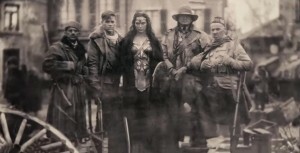 I was not that concerned about Wonder Woman being portrayed as some unstoppable figure of action in the middle of World War I or some one-dimensional feminist icon. To be honest, if Wonder Woman had simply been this “symbol of goodness and hope” in this new movie, I would have dismissed her as a boring character. I would also have dismissed the film as not worthy of my time. I believe that kind of description would have shoved Wonder Woman into some kind of whore/Madonna category, with her being “the Madonna”. Wonder Woman was a lot more than this “symbol of hope and compassion” . . . this Madonna. A lot more. For me, Princess Diana aka Diana Prince aka Wonder Woman was a person . . . an individual who was compassionate, strong-willed and intelligent. But she was also a person whose bubble-like upbringing by her mother, Queen Hippolyta, also led her to become a rather naive and unpractical person by the time she left her homeland of Themyscira Island with Steve Trevor. And her unwillingness to let go of her naivety also revealed that she could be quite stubborn. 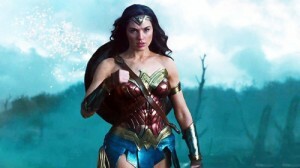 The reason why I liked the portrayal of Diana in “WONDER WOMAN” in the first place was that the movie was not afraid to show both the good and the bad about her character. And I have to thank director Patty Jenkins; screenwriters Allan Heinberg, Zack Snyder and Jason Fuchs; and actress Gal Gadot for this well-rounded portrayal. I found the Wonder Woman characterization quite refreshing and an example of really good writing. As I had stated earlier, I did not watch “WONDER WOMAN” in order to view the main character as some kind of one-dimensional feminist ideal or some symbol of everything that is pure, good and whatever form of moral saccharine that many critics seem inclined to dump on her. I wanted to see a story about a woman, a complex woman with virtues and flaws … and how she was forced to grow up and develop as a character. And as far as I am concerned, that is what I got. Throughout Hollywood history, the topic of the American Civil War has proven to be a volatile mix in terms of box office and television ratings. Robert Redford’s new drama about President Abraham Lincoln’s assassination called “THE CONSPIRATOR” proved to be the case. Directed by Redford and written by James D. Solomon, “THE CONSPIRATOR” told the story about Civil War veteran Frederick Aiken’s efforts to prevent Mary Surratt, the only woman charged in the Lincoln assassination during the spring and summer of 1865. Following the 16th President’s death and near fatal attack upon Secretary of State William H. Seward, a Maryland-born boarding house owner and Confederate sympathizer named Mary Surratt becomes among those arrested in connection to the crime. The Federal government, under the authority of Secretary of War Edwin M. Stanton, is convinced of Mrs. Surratt’s guilt because of her son John’s connections to assassin John Wilkes Booth and the other conspirators. Mrs. Surratt’s case was not helped by the fact that they had used her Washington D.C. boardinghouse as a meeting place; or that John managed to evade capture by the Federal authorities following the assassination. Mrs. Surratt summoned a fellow native of Maryland, U.S. Senator Reverdy Johnson, to defend her before a military tribunal. But political pressure from Stanton and others forced Johnson to recruit Aiken to represent Mrs. Surratt at the tribunal. Unfortunately, the 27 year-old Aiken lacked any previous experience inside a courtroom. The young attorney’s initial belief in Mrs. Surratt’s guilt and reluctance to defend her disappeared, as he became aware of possible evidence that might exonerate his client and that she was being used as a hostage and bait to lure her son John to the authorities through foul means. “THE CONSPIRATOR” proved to be one of those Civil War movies that failed to generate any interest at the box office. Most moviegoers ignored it. Many critics bashed it, claiming it was another of Robert Redford’s thinly veiled metaphors on the wars in Iraq and Afghanistan. I must be honest. I found this particular criticism worthy of some head scratching. Perhaps those critics had been right. But I must admit that I failed to see the metaphor. The manner in which the Army tribunal railroaded Mary Surratt to a date with a hangman’s noose sadly struck me as a very common occurrence throughout history. The wealthy and the powerful have never been reluctant to destroy someone they deemed as a threat or a convenient scapegoat. Superficially, Mary Surratt seemed like the type of person toward whom I would barely harbor any sympathy. The Maryland-born woman had been a Confederate sympathizer. I personally found her political and social beliefs abhorrent. Yet, by revealing the lies and manipulations that she had endured at the hands of the Army tribunal and Federal government, both Redford and screenwriter Solomon did an excellent job in igniting my sympathy. Mary Surratt’s experiences also reminded me that they could happen to anyone – even today. The idea of so much power against one individual or a particular group is frightening to behold, regardless if that individual is a slave, a Confederate sympathizer under arrest or an early 21st century citizen. Aside from displaying the dangers of absolute powers, “THE CONSPIRATOR” succeeded on two other points – at least for me. I found the movie’s basic narrative well written and paced to a certain degree. Both Redford and Solomon had been wise to focus the movie’s plot on Mrs. Surratt’s case. They could have included the testimonies regarding the other conspirators, but that could have resulted in a great deal of chaos. However, the other defendants’ participation in the conspiracy against the Lincoln Administration was utilized in an excellent sequence that conveyed the events surrounding President Lincoln’s assassination, the attempt on William Seward’s life, John Wilkes Booth’s death and the subsequent arrests. With this excellent introduction, the movie smoothly segued into Frederick Aiken’s efforts to defend Mrs. Surratt. However, no movie is perfect. And “THE CONSPIRATOR” had its own imperfections. My main problem centered on three characters – a close friend of Aiken’s named Nicholas Baker, who was portrayed by Justin Long; actress Alexis Bledel’s portrayal of Aiken’s fiancee, Sarah Weston; and the presence of Oscar winner Kevin Kline as Secretary of War Edwin Stanton. My only problem with Bledel was that her performance struck me as mediocre. No amount of romantic scenes or beautiful 19th century costumes could alleviate her performance. Justin Long’s presence proved to be a waste of time – at least for me. One, Redford and Solomon included a meaningless scene featuring the aftermath of a nameless Civil War battle with both James McAvoy’s Aiken and Long lying on the ground, wounded. What was the point of this scene? To establish Aiken’s devotion to the Union cause in the form of his friend, Baker? If so, I feel it failed to achieve this. Long was further wasted as one of the two friends who tried to convince Aiken not to defend Mrs. Surratt. Actually, James Badge Dale, who portrayed the young attorney’s other friend, William Hamilton, was used more effectively for this task. Long merely hung around slightly drunk or sober, as he grunted his disapproval toward Aiken. And I cannot understand why Redford even bothered to include his character in the plot. Also wasted was Kevin Kline’s portrayal of Edwin H. Stanton. Aside from convincing Reverdy Johnson not to personally defend Mrs. Surratt, barking instructions to government lackeys following the incidents at Ford’s Theater and Seward’s home, and ignoring Aiken’s attempts to contact him; Kline’s Stanton did nothing. I had expected some kind of confrontation between Aiken and Stanton . . . again, nothing happened. Fortunately for “THE CONSPIRATOR”, the good outweighed the bad. This was certainly apparent in the rest of the cast. I would never consider Frederick Aiken to be one of James McAvoy’s best roles. But I cannot deny that he did an admirable job in transforming Aiken’s character from a reluctant legal defender to his client’s most ardent supporter. He also infused the right mixture of passion, anger and growing cynicism into his character. I have seen Robin Wright only in a small number of roles. But I do believe that Mary Surratt might prove to be one of her best in a career that has already spanned over twenty years. What truly impressed me about Wright’s performance was her ability to avoid portraying Surratt as some ladylike martyr that barely did or said anything to avoid conviction. Although Wright’s Surratt did suffer, she also conveyed grit and determination to alleviate her situation. The majority of the cast for “THE CONSPIRATOR” gave solid performances. There were a few I considered standouts among the supporting cast. One of them turned out to be Danny Huston’s intense portrayal of the prosecuting attorney, Joseph Holt. Evan Rachel Wood superbly guided Anna Surratt’s character from a defiantly supportive daughter to a young woman on the edge of despair. Despite a slightly unconvincing Maryland accent, Tom Wilkinson gave an intelligent performance as U.S. Senator Reverdy Johnson. I could also say the same about James Badge Dale’s portrayal of William Hamilton, one of Aiken’s friends, who proved to be a wise adviser. As for actor Toby Kebbell, I have to admit that he made a convincing John Wilkes Booth. I cannot deny that Robert Redford and screenwriter James Solomon made a few missteps with the plot and at least two characters for “THE CONSPIRATOR”. But as I had stated earlier, the virtues outweighed the flaws. Both director and screenwriter provided moviegoers with a fascinating and frightening look into the abuse of power during a famous historic event. 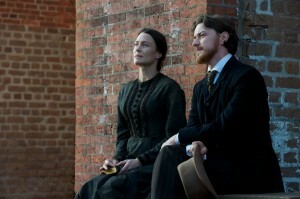 And they were backed by excellent performances from the likes of James McAvoy and Robin Wright. I only hope that one day, audiences might overlook Redford’s current negative reputation as a filmmaker and give “THE CONSPIRATOR” a second chance.